An amazing book, and how lucky I got to read it in the Czech Republic! I had it for kindle, translated by John Williams I think, so I may have to read the alternative translations. A little fan-girl of me perhaps, but to be reading it as we explored Prague’s castle and the Kafka Museum (which I wrote about here) was brilliant really. 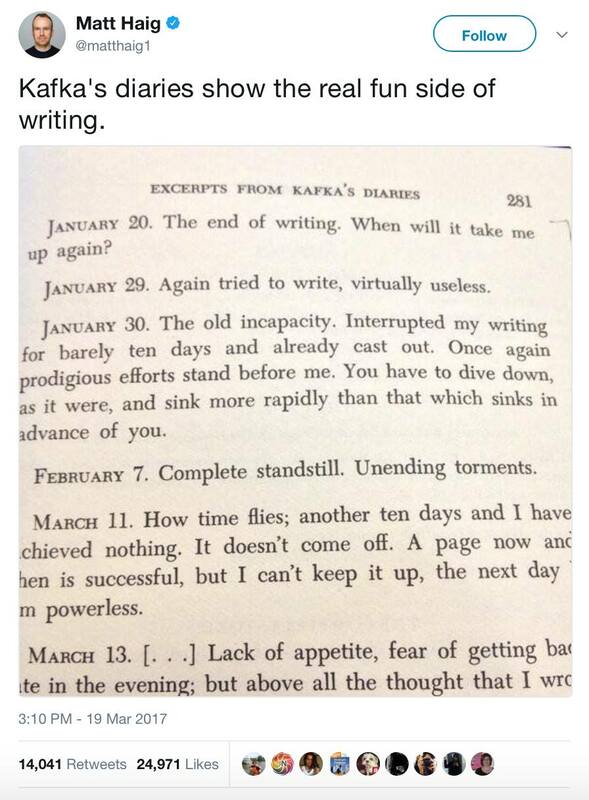 Though also existentially terrifying, as I find all of Kafka. Now, he could see the Castle above him clearly defined in the glittering air, its outline made still more definite by the moulding of snow covering it in a thin layer. There seemed to be much less snow up there on the hill than down in the village, where K. found progress as laborious as on the main road the previous day. Here the heavy snowdrifts reached right up to the cottage windows and began again on the low roofs, but up on the hill everything soared light and free into the air, or at least so it appeared from down below. On the whole this distant prospect of the Castle satisfied K.’s expectations. It was neither an old stronghold nor a new mansion, but a rambling pile consisting of innumerable small buildings closely packed together and of one or two storeys; if K. had not known that it was a castle he might have taken it for a little town. This shifts into a more mundane reality of village homes, churches, streets. But always the Castle itself remains something always seen yet always out of reach, an impossible distance to cover. K. walks and walks, yet overcome by strange weariness and drifts of snow, he turns aside. Day by day the castle becomes ever more distant, unreal yet at the same time ever more powerful in its oppression of his spirit and his circumstances. …it seemed to K. as if all contact with him had been broken off, as if he were now freer than ever, as if he could wait here in this otherwise forbidden place as long as he wished; as if he had fought for this freedom as few others could have done, as if no one could touch him or drive him away, or even speak to him, and yet at the same time — and this conviction was at least as strong–as if there were nothing more senseless, more desolate than this freedom, this waiting, this invulnerability (loc 1792). Above all remains the split between Castle and village, rulers and ruled at varying degrees of distance. There is a visual refinement in the faces of those who have been there, particularly the women singled out for gentlemen’s pleasures. Government is designed to preserve and enhance this split. The landlady tells K.
…it gives us doubts about everything. Is it really Castle work that he is doing, we ask; he goes to the offices, certainly, but are the offices actually part of the Castle? And even if there are offices that are part of the Castle, are those the offices he is allowed into? He’s admitted into some offices, but only some of them, then there are barriers, and behind these are more offices. He’s not actually forbidden to go any further, but he can’t go any further once he’s seen his superiors and they have dealt with him and sent him away. What’s more, you’re watched all the time up there, at least that’s what we believe. And even if he did go further on, what good would it do him if he had no official business there; he would just be an intruder. And you mustn’t imagine these barriers as a hard and fast divide, Barnabas is always reminding me of that. There are also barriers in the offices he visits, so there are some barriers he goes through, and they look no different from the ones he has not yet gone through, and so it can’t be assumed that the offices behind these barriers are any different from the ones Barnabas has been in (loc 2775). …all these differences are due to magic, they are quite understandable because they depend on the present mood, the level of excitement, the countless degrees of hope or despair on the part of the observer, who is in any case only able to catch a momentary glimpse of Klamm (loc 2809). What I mean by all this is that something is there, Barnabas is being offered something, at least something, and it’s his own fault if all he can get out of it is doubt, fear and hopelessness (loc 2923). Olga’s story was revealing such a vast, almost unbelievable world to him that he could not resist intruding on it with his own little adventure, in order to convince himself of the existence of her world as well as that of his own experience (loc 3402). Here everything was small but elegantly constructed, and space was used to the best advantage. The corridor was just high enough for them to walk upright. Along the sides was a series of doors almost next to each other. The side walls did not reach right up to the ceiling, no doubt to provide ventilation, for the tiny rooms along this deep cellar-like corridor probably had no windows. The disadvantage of these walls that were open at the top was that the noise in the corridor must have been heard in the rooms too (loc 3790). K. is betrayed by his own weakness, his own tiredness, he cannot take advantage of the interviews he obtains. And then follows the most brilliant of all scenes: the men pushing the carts, distributing folders, the opening and slamming of doors, whispered negotiations, hands emerging from rooms, peeping through cracks and recriminations. K.’s very presence throwing everything into complete chaos as no one can bear to let themselves be seen, much less spoken to. It ends in mid sentence — I didn’t know that when I started, so it was an almost vertiginous ending. Kafka couldn’t find his way to the ending, I know the feeling, and I’m not sure it could have ended. I found the beginning quite terrifying in its way, but that steadily dropped off, you can feel the tension unwinding somehow, even as it gets more interesting in other ways. …Kafka carries out a more difficult operation: he turns Prague into an imaginary topography which transcends the fallacy of realism. 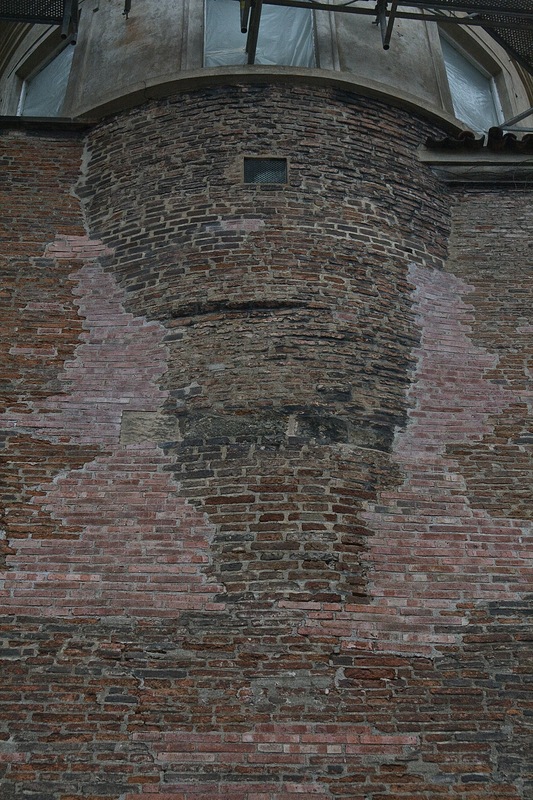 Kafka’s phantasmal architecture has other ends. 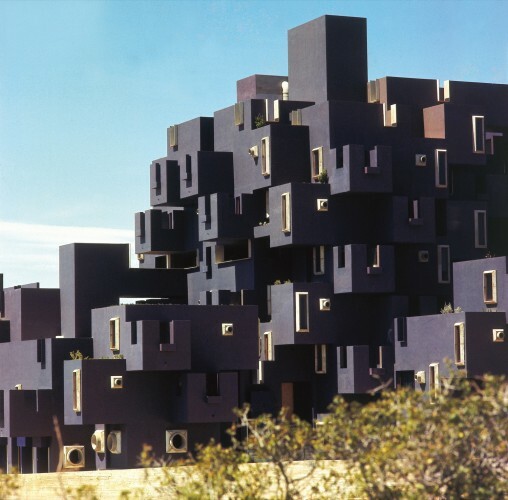 Rather than a particular house, school, office, church, prison or castle being important, it is what these constructions reveal when they act as topological metaphors or allegorical places. 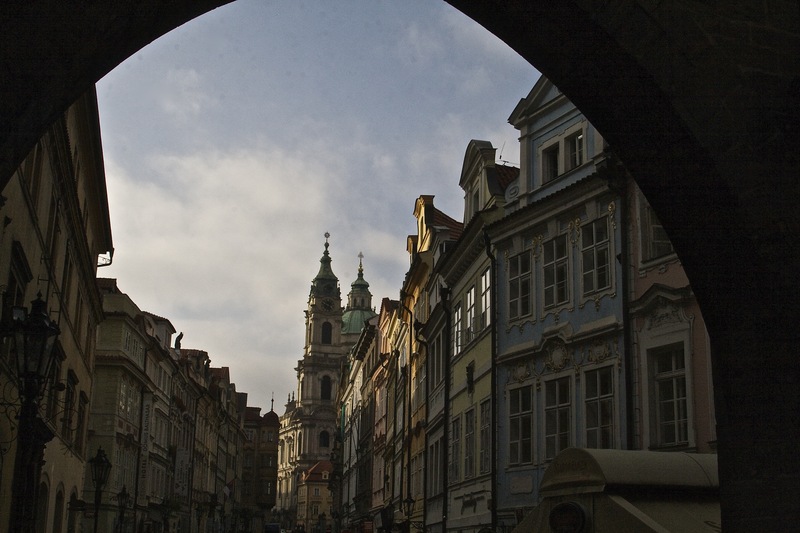 What surprises does this transfigured Prague hold in store? Just how far can the metamorphosis of a city take us? Of course, there are other candidates for the inspiration for The Castle, but Kafka grew up beneath this one, and being here made the book a little less dreamlike and removed from reality — just a little less. It never occurred to me to think of Kafka spatially or understand spatiality through Kafka, I never thought of him as a chronicler of space or the city. 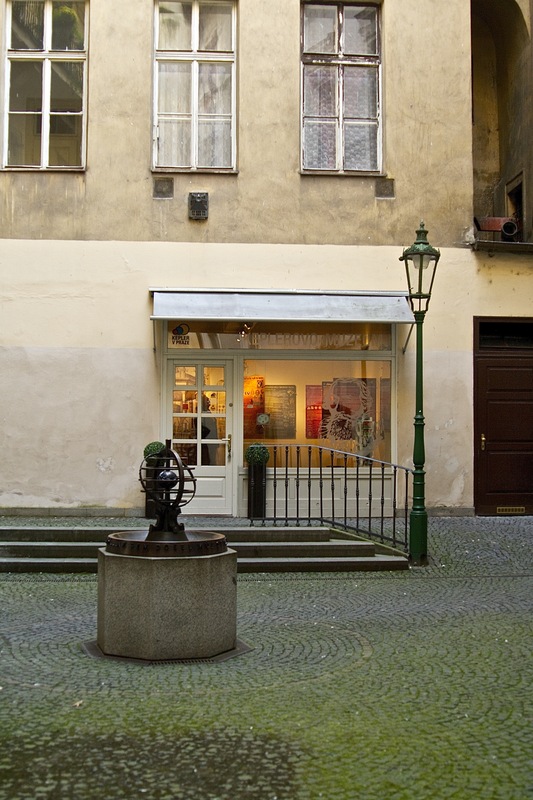 Yet the quite brilliant museum dedicated to him in Prague is entirely about space and Kafka’s relationship to his city, his ‘dear little mother with claws’, and I am fascinated now with thinking some of this through. It’s worth more than one blog post. I think here I shall just capture what I can of the exhibit, and then relate it to Kafka later — because when in Prague read Kafka and I am reading The Castle. Like all of Kafka’s work, I am finding it slow due to its harrowing nature and existential angst. So. The experience of the museum itself aims at something like a replication of the feelings inspired by reading Kafka, tries to help you enter his world…it succeeds on some level of reaching some different world some how (though if it is K.’s or not that is impossible to say), leaving me fairly awed, and so I can hardly explain what it’s like to experience it. Darkness, unexplained noise, images shimmering like pools of water, photographs and collections of personal items and writings, short films, a surrounding of file cabinets and ancient phones. 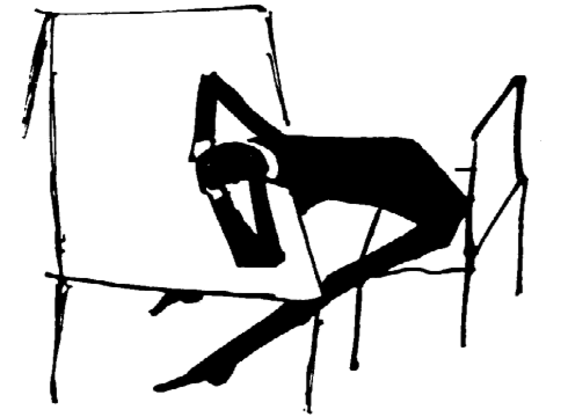 Not everything is translated into English or Czech — Kafka wrote in German after all. The different spaces are given context by beautifully written passages as provocations scattered throughout that demanded much more thinking. In this first stage of our immersion into the world of Kafka, we look at how the city affects the writer, how it shapes his life, the mark it leaves on him. 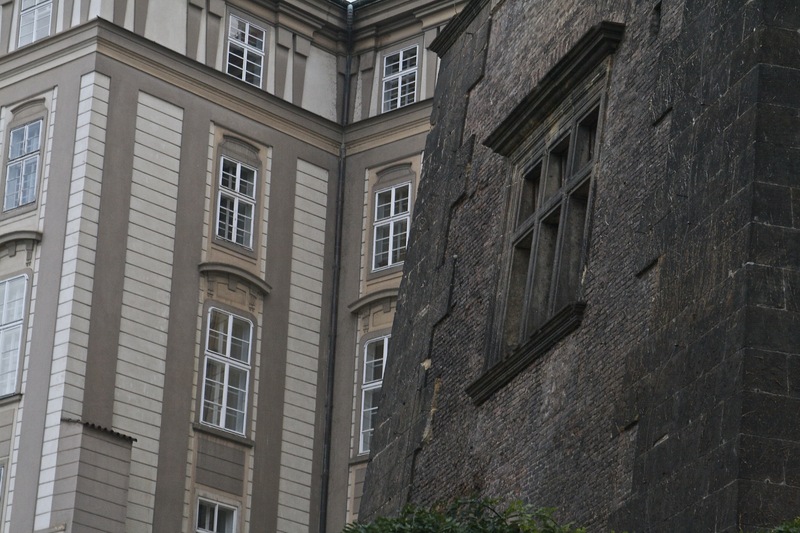 Prague acts on Kafka with all of its metamorphosing power, confining him to an existential space which he can only enter by “fixing his gaze on the surface of things”, Prague forces Kafka into a spatial constriction, steadily dosing out its secrets. 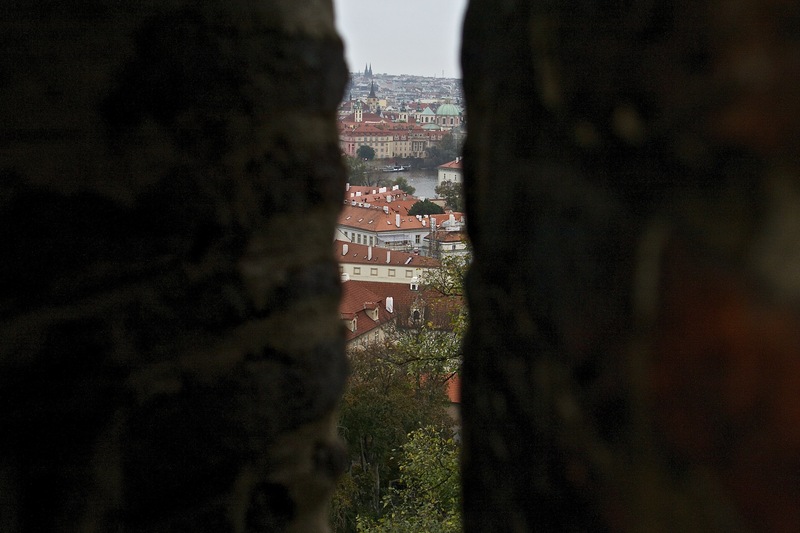 Prague contributes myth, obscure magic, and provides a magnificent backdrop, but it abhors clarity. And this is precisely what Kafka captures. This is the city’s action upon the writer, the way it shapes and molds him, the way it confines him in dialectical relation to how he sees and writes it. 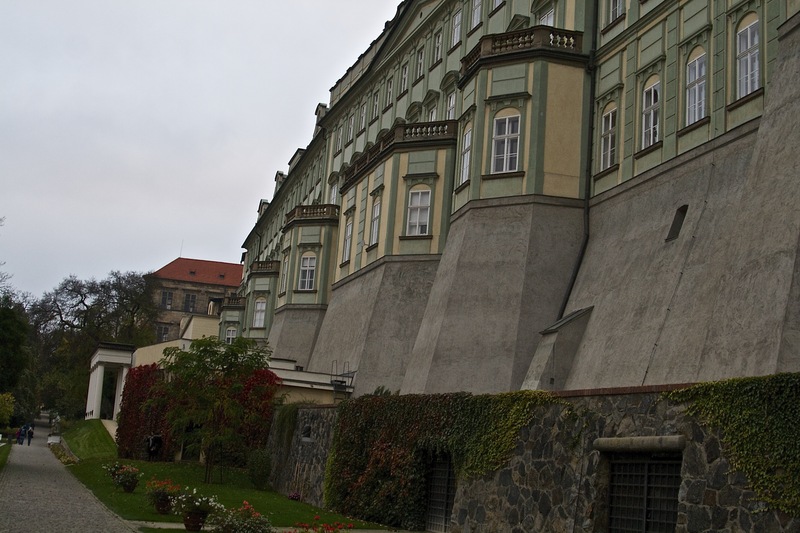 All writers know that in writing you make things more real, but does Prague abhor clarity? How does a city choose one way or the other? 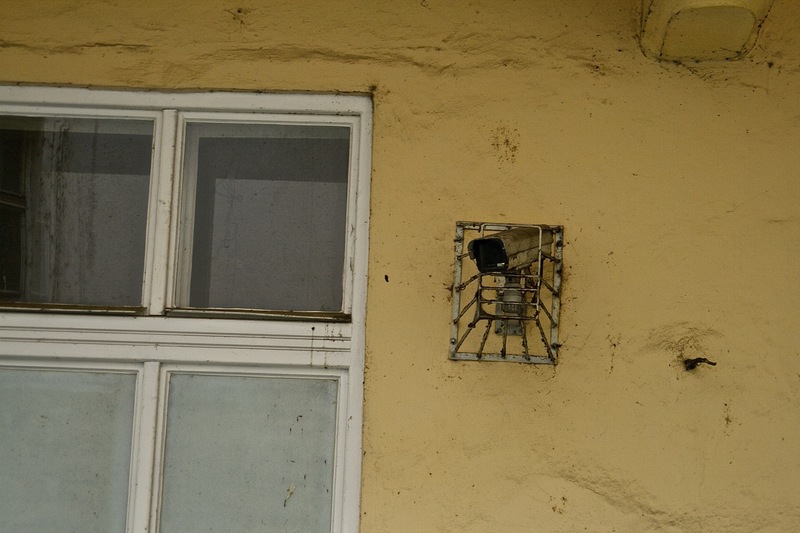 Our aim is to explore the city, seeing it from Kafka’s point of view. An exclusively biographical or merely chronological approach would not be enough; the challenge lies in condensing the principal conflicts in the life of Kafka in Prague, guided by the writer’s own views. This means joining Kafka on his descent into the depths of his city, adapting ourselves to his sensorial range and cognitive register, becoming involved in a gradual distortion of space-time – in short, agreeing to an experience where everything is allowed except indifference. 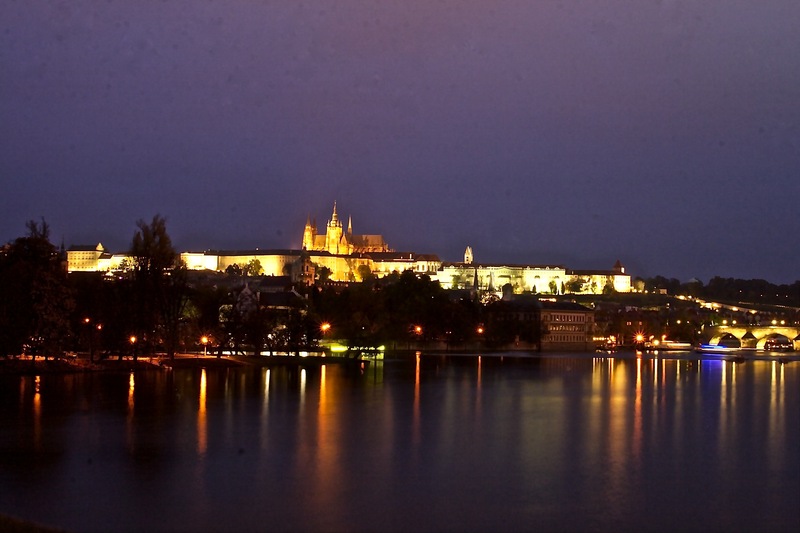 Franz Kafka is born in the interior of a myth named Prague. A city where three human groups act (Czechs, Germans and Jews), reunited through the centuries and, in spite of that, separated by cultural, racial and linguistic differences. The conflict leaves its imprint in the physiology of the city, converts neighbourhoods into airtight compartments, defines invisible frontiers, but it does not ultimately define the nature of the cage. It is also necessary to gain an intuition of it from the perspective of the bird. Let us imagine an childhood where the I is an enigma and the community, an entelechy. A home besieged by dead brothers, distant sisters, cold governesses and a scathing cook. A world perceived from fear and guilt, in which the figure of the father spreads throughout leaving very little space for the life of a Son. Inside of us still live the obscure corners the mysterious passages, the blinded windows, the dirty patios, the noisy taverns and inns with their locks. We walk down the wide streets of the new city, but our steps and looks are insecure. On the inside we continue to tremble just like the old alleyways of misery. Our hearts still have not understood the sanitising that has taken place. The old and unhealthy jewish city inside of us is much more real than the new hygienic city that surrounds us. Awake we walk traversing a dream: we are nothing more than the ghost of times past. 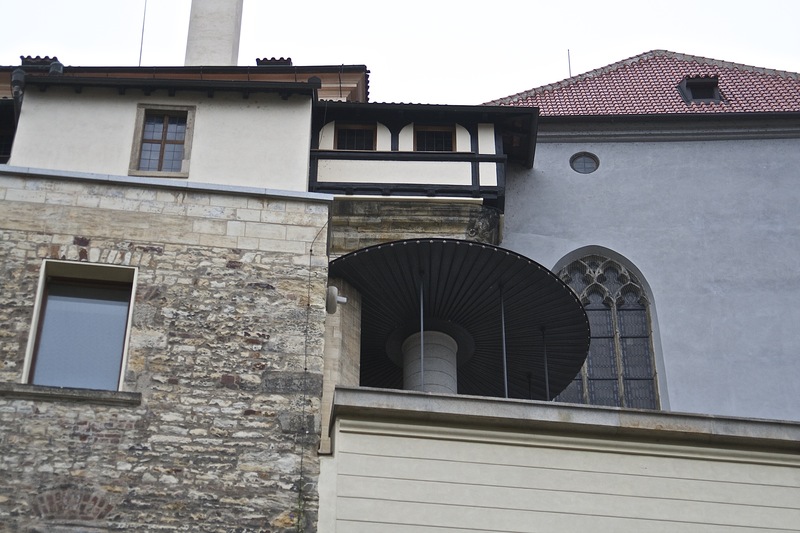 I OFTEN MARVELLED at Kafka’s wide knowledge of all the varied architectural features of the city. 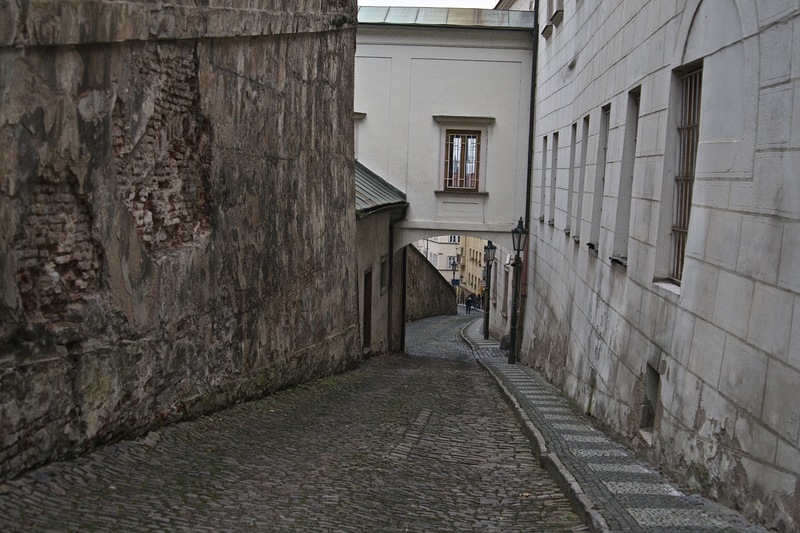 He was familiar not only with its palaces and churches but also with the most obscure alleys of the Old Town. 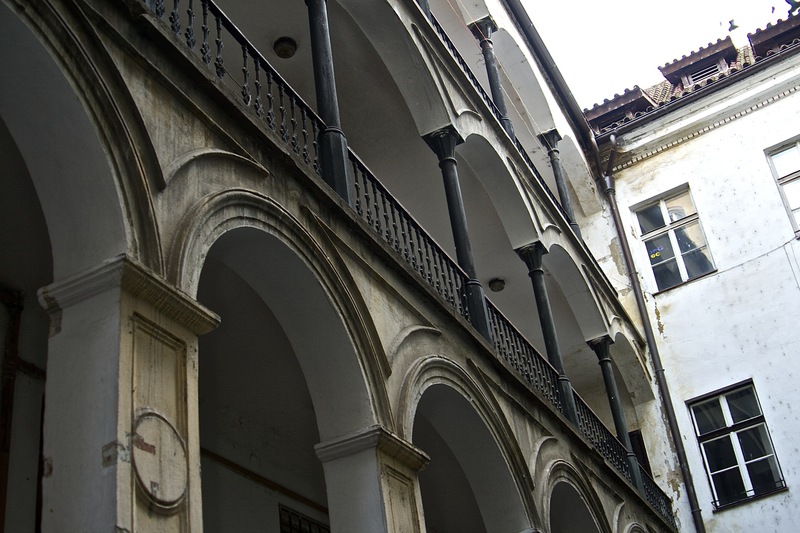 He knew the medieval names of the houses even though their ancient signs no longer hung over their entrances but in the city museum in the Poric. 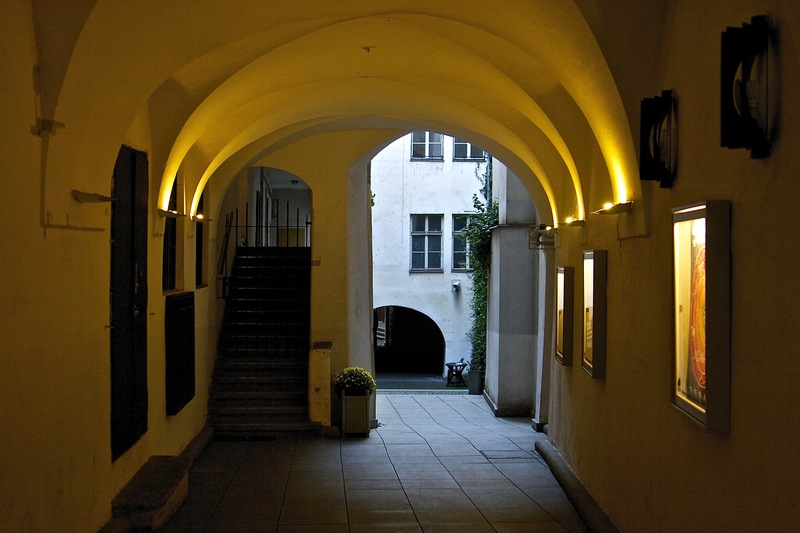 Kafka read the city’s history out of the walls of its ancient houses. He conducted me by crooked alleyways into narrow, funnel-shaped interior courtyards in Old Prague, which he called “spittoons of light”; he walked with me, near the old Charles Bridge, through a baroque entrance hall, across a court no bigger than a handkerchief with round Renaissance arches and through a dark tubular tunnel, to a tiny inn enclosed in a small court which bore the name of The Stargazer (Czech: U hvezddru), because here Johannes Kepler had lived for many years, and here, in the year 1609, his famous book, which far outstripped all the scientific knowledge of his day, the Astronomia Nova was born. Kafka loved the streets, palaces, gardens and churches of the city where he was born. He looked with joyful interest through the pages of all the books on the antiquities of Prague which I brought to him in his office. His eyes and hands literally caressed the pages of such publications, though he had read them all long before I placed them on his desk. His eyes shone with the look of a passionate collector. Yet he was the precise opposite of a collector. The past was for him not some historically dead collector’s piece, but a supple instrument of knowledge, a bridge to today. . . . There is a tiny museum now where Kepler lived. Imaginary topography – The way Kafka creates the layers of his city is one of the most enigmatic operations of modern literature. 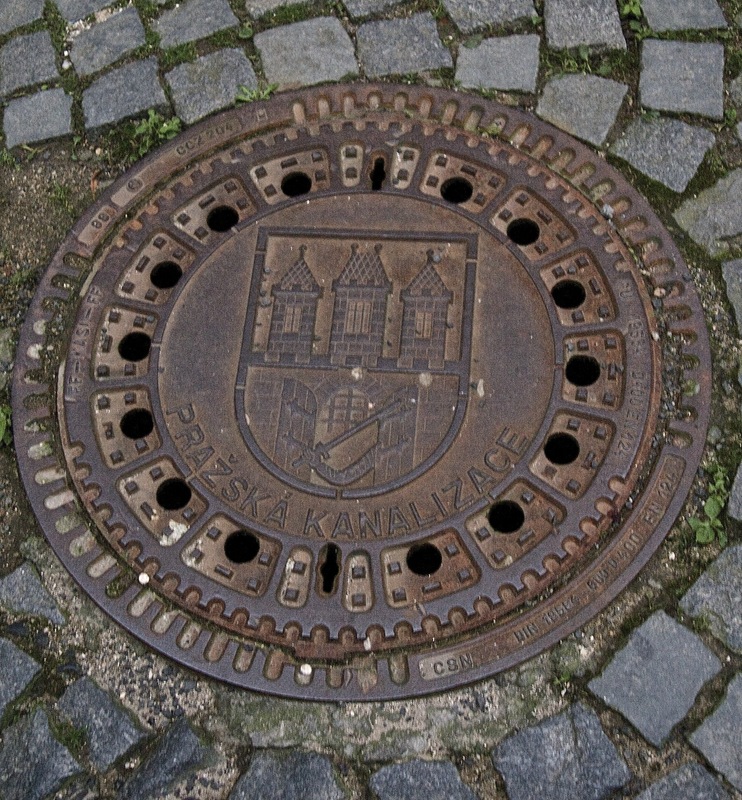 With only occasional exceptions, Kafka does not name the places he describes in his novels and short stories. The city steps back, is no longer recognizable by its buildings, bridges and monuments. And even if they are recognized by an inhabitant of Prague or by a student of Kafka, they have since become something else. Into a passageway lined with filing cabinets and his drawings brought to life (Conversations with Kafka is full of them). I love this one, but who has not felt like this? There is a wonderful short film of The Castle, almost entirely white, confusing, letters and figures melting into and out of sight, lonely figures never reaching where they are going. The last room is a harrowing one based on ‘In the Penal Colony’, a model of the torture, a film of skin being cut and scarred visible only through narrow windows. I’d been unsuccessfully fighting off a cold, but confess to a feeling of unsettledness, almost nausea by the time we descended the stairs, it affected me physically and that in a way is my greatest testimony. Kafka’s books affect me the same way, I cannot read them all at once, cannot read them before bed. They fill me with fear and angst and confusion and I admire them immensely. But now I am almost eager to search for the outlines of domestic space, of work space, of the city as described here in this post, The Castle is perhaps the easiest, and the one I am reading now. Climbing up to Prague’s own castle — less a castle than a complex of Baroque magnificence engulfing the old gothic buildings — it seems easy to me to see how this is at once a physical and an existential space, something rooted in both history and in the terrors of the mind. But more of that when I finish the book.